In the beginning, it was Churchill's idea... a way of putting the old "pre-dreadnaughts" to useful service and making a show of strength in the waters off Istanbul which would, he said, cause immediate regime-change and take Turkey out of the war. It was thought very little infantry would be needed. And yet, the big naval attack had almost succeeded. The Allies would not know until after the war ended how close they had come to achieving their breakthrough on the Dardanelles. It was the first of many "what might have been" episodes, where success was just one more push, one more aggressive movement away...in contrast to many times when failure was reinforced and repeated. A Fatal Attraction brings this campaign of tragedy and opportunity to life. The counters represent brigades, batteries, and ships, and players have the chance to do better than their historical counterparts, while gaining a greater appreciation for the difficulties faced by both sides, including supply shortages, command/control difficulties, and random events. 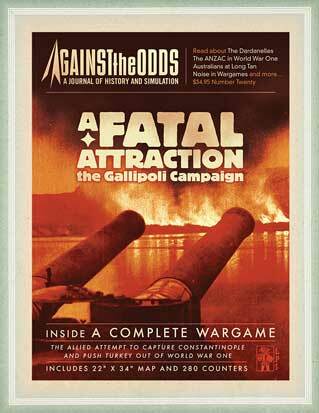 With A Fatal Attraction, you'll find everything you need to understand Gallipoli except the smell and the flies. The Expanded Edition option below (only available directly from us) for this game comes boxed and also includes "An Ever So Fatal Attraction", an expansion kit for the base game with extra counters and rules for leaders, submarines, and increased land and naval support for both sides!